Can you believe that around 67 million households within the US own pets? With It certainly is not surprising, then, that a lot of homes deal with pets odors and pet stain in their carpeting. When you own pets, mishaps will occur. OxiGreen in Bensalem, PA knows how annoying these problems can be. Hopefully the guidelines we have put together in this article will help you avoid making a mistake if you attempt to eliminate pet and other stains on your carpet. • Before attempting to eliminate a stain in your carpet, it's wise to act as soon as possible while the stain is fresh. New stains acted on quickly have a 75% greater likeliness of getting the stains eliminated. • As heat sets many blemishes, be cautious to never make use of an iron or use hot-air to dry the problem area until you're certain that the stain is completely gone. • NOTE: Remove as much of the spot as possible by blotting liquid blemishes and scraping up solid stains, such as mud. • If the liquid spill is large and you have got access to a wet/dry vac, use that. • I cannot over emphasize this enough, you must be very careful to not do something which may spread out the stained area. • Before using chemicals to eliminate spots, test a region that is hidden like a closet before trying it on the stain. This extra measure of extreme caution will help to make certain you don't end up harming the carpet or rug fiber or discoloring the carpet. Because it is unseen, you can test an additional stain removal solution until you discover just what will work. • When you apply the spot removal treatment, move starting from the outward borders of the stain toward the center. A word of caution: blot the moisture out of your carpet, see to it that that you do not scrub the carpet fiber using a stiff bristled brush. The brush could ruin your carpeting. • When you do use a chemical type spot remover, you'll want to thoroughly rinse the area with filtered water. Then be sure to dry the spot as much as possible. When you are removing spots on upholstery or carpets, apply a thick pad or a couple of towels to dry out the region by weighing it down with barbell weights or any other heavy item. Leave everything in position through the night. This helps to soak up any remaining moisture. • Brush the pile to fluff the carpet fibers when you are finished. While some stains could possibly be eliminated with the help of this Do It Yourself approach, often times the spot is beyond your capability to get out. 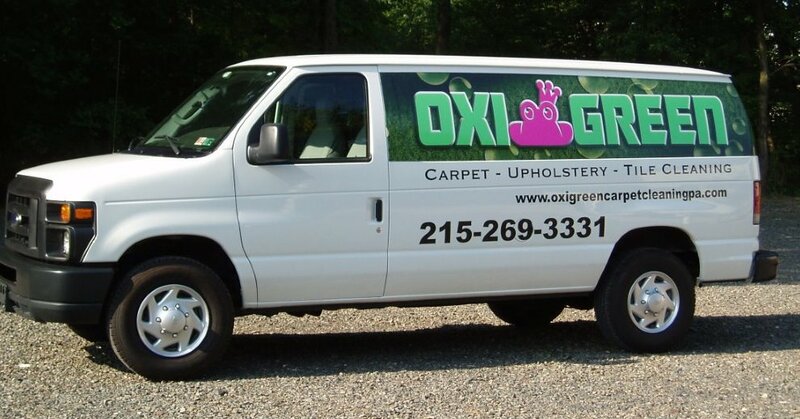 We here at OxiGreen in Bensalem, PA reassure you that we have years of expertise, the proper machines, and the training to remove just about all carpet stains. For fast stain removal, please call OxiGreen in Bensalem, PA at 215-269-3331 today! We can assist you with your carpet and upholstery stain and odor problems as well as your many other carpet cleaning requirements. OxiGreen in Bensalem, PA is all set to go to work for you, call us today!